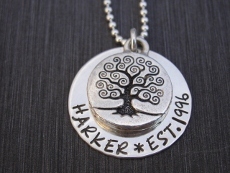 Celebrate your family with our family tree necklace. A 7/8" sterling silver disc is stamped around the bottom with our script font (max 25 characters.) The disc is layered with a tree of life charm. The disc is hung on sterling silver ball chains which are 16", 18" or 20". To order this item, please select a style, enter name(s) , and/or date, then click Add to Shopping Cart button. Hip Tip: Celebrate the year that you began your life together or display your family's names under the Tree of Life.